Ok, first of all, just let me clarify that I never met for this post to look so kiddish. My boyfriend shot this series for me and somehow he just makes me laugh everytime when we shoot so I can't help but look like a little girl. Ok that, and maybe because of the colors in this photo. 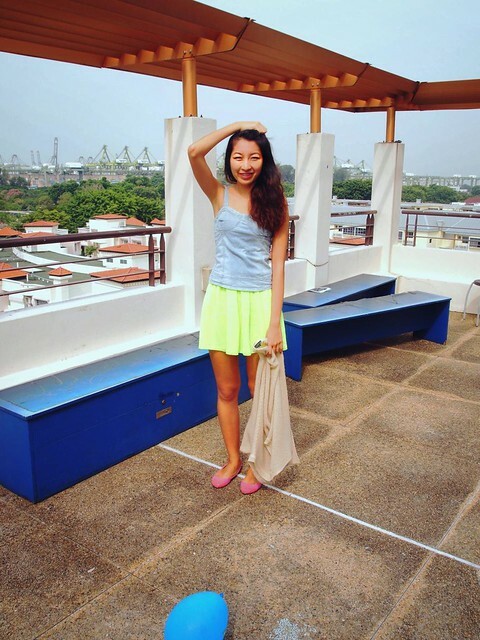 I am really in love with this neon green skirt from American Apparel - this just adds to my neon collection on top of my Zara neon asymmetric skirt that I've worn here. Anyway, I'm great to announce that American Apparel ships to Singapore now! You can now conveniently shop their full range online and have them delivered straight to your doorstep. Prices are cheaper compared to getting them at the limited shops that stocks AA in Singapore as well (check out the banner at the sidebar of my blog!) I love American Apparel because of the free spirit that they embody - by casting models of all body shapes and sizes, and different ethnicity. And quite a lot of their clothes are unisex too, which means I can get to share with my boyfriend! They're best known for their stretchy latex wear - made into disco pants and hotpants. Lots of American celebs love them also - Miley Cyrus is known to have worn their latex hotpants for her concerts! I'd also like to invite you to join www.vauntstyle.com using the invite code "emelia" since it'll add to my points on the site.. hehe. its currently invite only so you'll be on the first to join the site!